The UKs capital city is renowned for many things, but nothing more so than it’s proud history and ancient traditions, many of which are still practiced to this day. Therefore, it’s really no surprise to discover that in this rich environment, London jewellers design and produce engagement rings, necklaces, brooches and earrings that boast an almost unrivalled historical pedigree. At Taylor & Hart, our designers use London’s past as an unlimited source of inspiration: adopting, embellishing and reinterpreting motifs and styles to come up with unique and timeless designs. Whether you want your engagement ring to hint at the city’s historical heritage or to evoke a specific period’s style, we are confident that we can find a perfect balance of the modern and antique in the design of your ring. Join us as we explore London’s history of jewellery and share the traditions and the stories that have inspired generations of jewellers. If you ever find yourself asking “What did the Romans ever do for us?”, one answer will be “they gave us gold to make jewellery”. By the 1st century AD, Londinium blossomed into a major mercantile centre thanks to its position on the River Thames and its political importance as the capital of Roman Britain. Today London is home to the Temple of Mithras, nestled between the Bank of England and St Paul’s Cathedral. The site’s excavation over the last couple of years has yielded archaeological finds that echo this earliest period of jewellery making in the capital. Period Highlight: Unmounted intaglio gem intricately carved with a representation of a 3rd century Roman warship. Also known as a cameo. See it for yourself: In October 2017 the archaeological site will be incorporated into the European Headquarters of Bloomberg. The Mithraeum has been reconstructed and will be displayed in a new museum that will be established on the site of the new development. Between the 5th and 11th centuries, London was known as Lundenwic. At this stage the British Isles were a collection of kingdoms, and Lundenwic (whose nucleus was in the area known today as The Strand) was part of the Kingdom of East Anglia. Saxon jewellery was varied and extravagant with lots of gold used for necklaces and bracelets. Amber and amethysts were popular gemstones, as were glass beads. 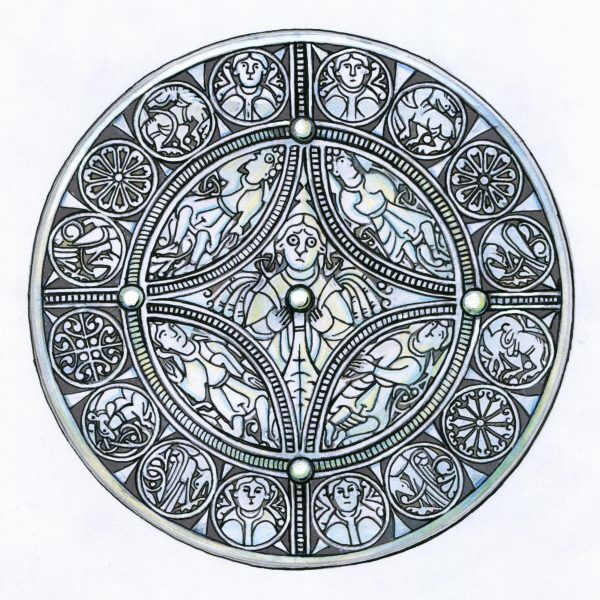 However, it’s the skill and artistry in the gold engravings that they produced which really set Anglo-Saxon jewellery design apart when it comes to inspiration for our engagement ring designs. Period Highlight: The Fuller brooch is decorated with a personification of the 5 Senses. It’s the niello inlay and elegant open-work of the outer zone that excites designers when they’re looking for stylistic inspiration. See it for yourself: If you want to see whether Anglo-Saxon craftsmanship might also inspire you, then you’re in luck. In 1939 the famous Sutton Hoo treasure hoard was discovered and many of its jewellery pieces are now on display in the British Museum. London jewellers are particularly fond of the serpents, birds and beasts that are zoomorphically depicted as interwoven links on ‘The Great Gold Buckle’. While one couldn’t really call it the UK, England started to resemble something more like what we know today after the Norman invasion of 1066. All the small kingdoms vanished, and William the Conqueror declared London as his capital city in the new single state. London’s jewellery scene was thriving during this period. After all, the Crown Jewels were fashioned for the coronation of William’s predecessor, Edward the Confessor in the tenth century. Sadly, 600 years later, Oliver Cromwell liquidated these during the English Civil War. However, all is not lost. Medieval England, with its knights in shining armour, chivalric codes and stories of love, is undoubtedly one of the most romantic periods in history. At Taylor & Hart we often draw inspiration from this era to design an engagement ring loaded with historical nuances for our more traditional couples. It’s not just the style and technique of ring making that is steeped in history: even the authentication and quality assurance that is applied across the UK for all precious metalwork goes back to the Middle Ages. Your hallmark is issued by the Goldsmiths’ Company Assay Office which was founded in the 14th century. Merchants were required to take their goods to Goldsmiths’ Hall for testing (hence the term ‘hallmark’). If the gold or silver piece passed the quality test it was stamped with an image of a leopard, the king’s mark. If it was below par it would be forfeited to the royal coffers. From 1850 the leopard gave way to the crown stamp that we are familiar with today. Period Highlight: The Dunstable Swan Jewel (on display in the British Museum). This piece dates from 1400 and is a livery badge in gold, white and black enamel which was worn as a badge of membership to a knightly Order. See it for yourself: In the UK, London’s Victoria & Albert Museum is the place to go to get a flavour of medieval jewellery. They have an unrivalled collection of ring brooches that demonstrate the virtuosity of the London jewellers who engraved magnificent patterns embellished with beautiful gems. Not satisfied with the European terms Renaissance and Baroque, UK historians labelled the same periods Elizabethean, Stuart and Jacobean. When it comes to jewellery, though, this isolationist nomenclature is misleading. There was an influx of international jewellery and influence, which was combined with advances in gemstone cutting techniques, to produce pieces that glittered and shimmered in a way that is more reminiscent of modern day dazzle. Rose cut and emerald cut diamonds started to appear along with other fancy cutting styles, and their beauty continues to inspire London jewellers today particularly in the design of engagement rings. Period Highlight: In the Museum of London’s collection, there is a gold ring with white enamel that inspires diamond lovers as the diamond has a table-cut crown and ‘scissor-cut’ pavilion. Its survival is especially precious to jewellers as most of these diamonds were re-cut by 1700 and examples of the style are particularly rare. See it for yourself: Before Hatton Garden, Cheapside was once the centre of London’s jewellery trade. However, in 1666 the Great Fire of London swept through the area destroying all of the buildings. Later in 1912, workmen excavating a cellar uncovered a huge trove of hidden treasure now known as The Cheapside Hoard. The collection of 16th-century and early 17th-century pieces made from Paris Touch gold was likely buried when the building above collapsed in the fire. Today the Museum of London has a fantastic set of galleries devoted to the Hoard. To my mind the explosive creativity in London’s jewellery making business during the Victorian and Edwardian periods was ignited by the contradiction inherent in the technological advances of industry and the reimagining of medieval London in the artistic field. Known also as Romanticism and neo-Gothicism, the style favoured by London jewellers harked back to the perceived romance of the Middle Ages in the UK. With artistic giants such as William J Turner and William Blake exploring ancient cultures and their spiritual resonance, the designers of necklaces, pendants, earrings and engagement rings followed suit. Many designs that we’ve fashioned at Taylor & Hart have been inspired by Victoriana. You can spot this influence in the use of motifs like hearts, clovers, love knots, arrows, vines and leaves. Clusters of seed pearls and complex enamelling also hark back to this period. Period Highlight: Queen Victoria’s Golden Jubilee Necklace is an exemplary piece of Victoriana complete with seed pearls, quatrefoil and trefoil diamond patterns. When Prince Albert died, Queen Victoria’s grief took on an iconic status that impacted not only the London jewellery scene but dictated fashion trends across the country. Mourning jewellery saw the rise of jet from Whitby, in the North of England. While black gemstones might have had a morbid overtone in the 19th century, their use in an engagement ring today is a daring statement. See it for yourself: As luck would have it, the best display of Victoriana in London is at the V&A Museum (dedicated to Queen Victoria and her Prince Consort Albert), which is also where we suggest you go to see the best collections of surviving medieval jewellery. You’ll be able to see the originals that inspired the designers of the Victorian period in one visit. A consequence of industrialisation was the boom in mass produced products. The Arts and Crafts movement was inspired by a rejection of this perceived inferiority; therefore, the burst of creativity in this century was not confined to monarchs and evocative sentimentalism. Followers of the Arts and Crafts movement were also drawn to the jewellery of the Middle Ages and focused more on simple polished stones that evoked the more handmade, tooled look of the pre-machine age. Period Highlight: Ashbee’s Peacock Brooch has served as inspiration for many London jewellers with its elegant rendering of nature’s own magnificent designs in precious metals and stones. The organic lines of the Art Nouveau style or the clean, geometric edges of the Art Deco period are renowned elements in striking jewellery design. These contrasting styles emerged in the late 19th and early 20th centuries. London jewellers were heavily influenced by the Parisian movement with its elegant bird and flower forms. Prolific designer, Archibald Knox, became Liberty’s primary designer at the height of their success, where he mostly designed for precious metal and pewter ranges. His designs took inspiration from the ancient Celtic stone crosses found on his home island, The Isle of Man. Knox’s work helped transform the department store from an oriental warehouse to a cutting edge design retailer, with Liberty’s founder, Arthur Liberty, becoming a firm patron for the Art Nouveau movement. Designers who favoured the stylistic vocabulary of Art Deco produced jewellery that celebrated the geometry of the step cut, asscher cut, baguette and emerald cut. The strong, bold appearance of these stones was complemented by motifs taken from African, Chinese and Ancient Egyptian cultures. Period Highlight: Archibald Knox’s gold, pearl and enamel necklace in the Tadema Gallery (Charlton Place, London) displays all the classic motifs of this style era; from its swirling organic flourishes in precious metal to the innovative setting of its pearls. Generations later, this piece remains a treasure trove of inspiration. See it for yourself: The V&A Museum has the most comprehensive display of Art Nouveau jewellery in London, and we use it as a fantastic repository of inspiration. If, however, your curiosity about the Art Deco style is piqued then you should visit Eltham Palace in Greenwich. This was the home of wealthy eccentrics, Stephen and Virginia Courtauld, who acquired the palace site in the 1930s, proceeded to redevelop the home into a dramatic shrine to Art Deco design. Its renovation has said to be a “masterpiece of modern design”. 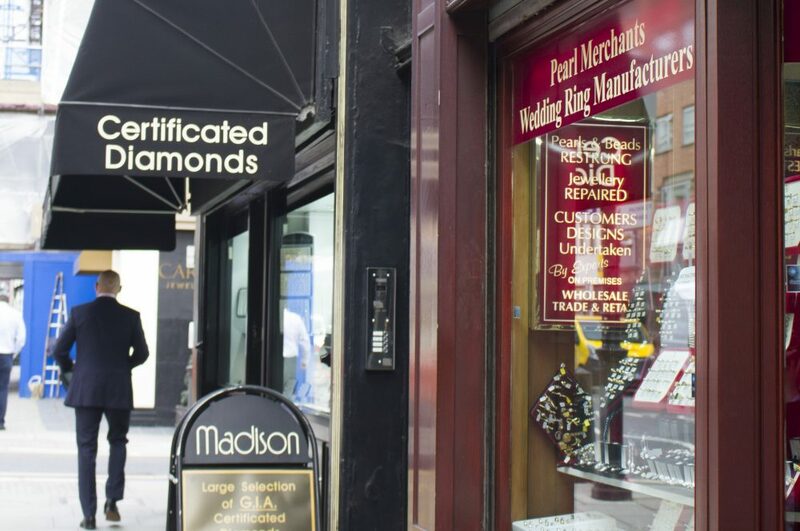 If you’re in the market for an engagement ring then you’re probably aware that Hatton Garden is London’s Jewellery Quarter. This area was occupied by the industry at the end of the 19th century after the discovery of South Africa’s Kimberley Diamond Fields and the rise of the de Beers family. 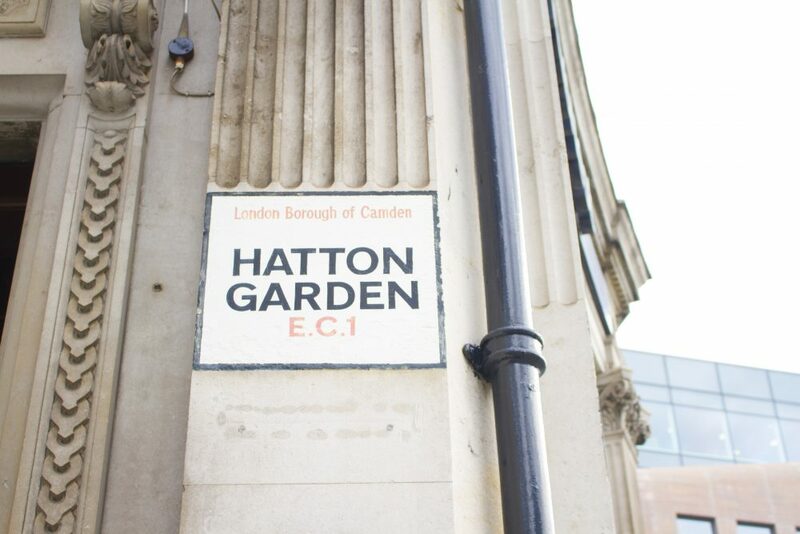 In its first incarnation, only Hatton Garden merchants worked with the trade. Trading in gemstones was a strong tradition in the London Jewish community so it wasn’t unusual to come across rough diamonds on sale alongside the bagels and chopped liver of the kosher delis. Today, families of the craftsmen in the workshops of Hatton Garden have worked in the jewellery industry for generations. The London Diamond Bourse is a diamond exchange, based in London’s Hatton Garden area. As of 2016, it has been trading for 76 years, but with rising property prices, the bourse is having to consider moving out of London’s centre to a new suburban location. Jewellery styles and techniques have evolved over the centuries through a combination of innovation and historical inspiration. It goes without saying that jewellery making is our passion, and one of the most exhilarating elements of the whole affair is the rich historical tradition that we are privileged to be part of as a leading London jeweller. If you commission an engagement ring from us at Taylor & Hart we’ll be creating a design that draws on and reinterprets the stylistic vocabulary of the past in a way that will deliver a timeless and unique piece for your intended. Taking inspiration from the past, we combine this with latest technology to make jewellery design easily accessible through 3D technology that allow you to gain a better understanding of your design before it’s crafted.